The face of Global Terror has been revealed and it wears a toque and plaid flannel! Getting rid of vintage “beer fridges” – secondary fridges which many North American and Australian homes boast – could have a significant impact on household greenhouse gas emissions, suggests a new study. Beer fridges are additional fridges that are generally used to keep beer and other drinks cold on top of a household’s primary fridge for food. One in three Canadian households has a second fridge, many of which are aging, energy-guzzling models, according to Denise Young, a researcher at the University of Alberta, Canada. Young suggests that getting rid of older models, in Canada at least, would have an impact on energy usage. Her study analyzes industry data and the results of a national survey to look at the environmental effects of having beer fridges in Canada. "People need to understand the impact of their lifestyles," says Joanna Yarrow, director of Beyond Green, a sustainable development consultancy in the UK. "Clearly the environmental implications of having a frivolous luxury like a beer fridge are not hitting home. This research helps inform people – let's hope it has an effect". The survey that Young analysed was commissioned by Natural Resources Canada and suggests that 30% of households have two or more refrigerators. About 20% of secondary fridges are older models that are kept after the household buys a newer model as their primary refrigerator. Having a second fridge for cooling drinks means more demand for electricity, and this demand is even worse when the second fridge is an older model. The Canadian Appliance Manufacturers Association estimates that typical 1985 refrigerator models use 1060 kilowatt-hours (kWh) of energy per year, while a 1975 model uses 1580 kWh per year. In contrast, more recent and energy-efficient models can use as little as 380 kWh per year. The survey shows that in 2003 about 65% of beer fridges were more than 10 years old. About 30% were at least twice that age. Using the survey's information on the distribution of beer fridges and the data on energy consumption, Young calculated that the 65% of beer fridges that are 10 years or older consume 1165.7 million kWh of energy each year – roughly equivalent to the annual consumption of 100,000 average US suburban homes. By abandoning beer fridges altogether, Canada's 11.5 million households could save 3500 million kWh each year, says Young. Young also found that low-income families were less likely to retire their old refrigerators to the garage to store drinks after buying a new model. She says this is probably because these households find the cost of running an additional fridge (up to $150 per year) too high. She concludes that middle- to high-income families should be targeted by campaigns to remove old secondary refrigerators. Existing schemes encourage people to buy new more energy-efficient fridges by offering financial bonuses for each purchase – sometimes with a cash-back offer for handing in older fridges. Young warns, however, that "these financial incentives may also induce a household to purchase a new unit earlier than they would have otherwise done so", which can actually encourage people to keep a second fridge. Instead, Young supports government-run "round-ups" offering to pick up and dispose of old refrigerators. A 2006 study commissioned by the Ontario Power Authority showed that such programmes have been successful in the past, especially when they are boosted by information on how much money and energy can be saved by getting rid of the beer fridge. But environmental effect of beer fridges depends on the source of electricity. "In Canada, there are major regional differences," notes Young. "In places where hydroelectric power is used, the greenhouse gas emissions are negligible. In places where coal or natural gas are used, the impacts can be substantial." She calculates that a 1975 fridge in British Columbia – where most electricity comes from hydropower – is responsible for a negligible increase in emissions. But the same fridge in Alberta, where electricity is primarily generated from natural gas and coal, would be responsible for 1.4 tons of greenhouse gases every year. 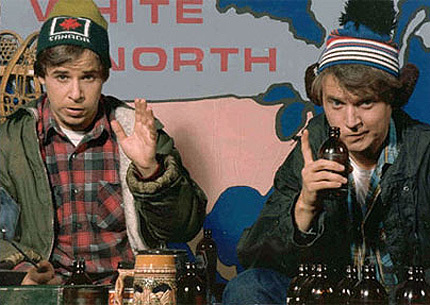 In the words of the McKenzie Brothers, I say you global warming nuts can Take Off!